You know that mound of giant dark-ish green “bananas” at the grocery store that you’re always tempted to buy but might not know what to do with? Those are plantains. Plantains are a starchier banana that you can slice, fry, mash, sautee grill, etc while still maintaining it’s integrity. Dishes involving this savory fruit are typical in Latin American and tropical cuisines…in fact, the first time I ever tasted a plantain was maybe 15 years ago at a Cuban restaurant in Orlando, Florida. Nowadays, plantains are everywhere (especially plantain chips as an alternative to potatoes). 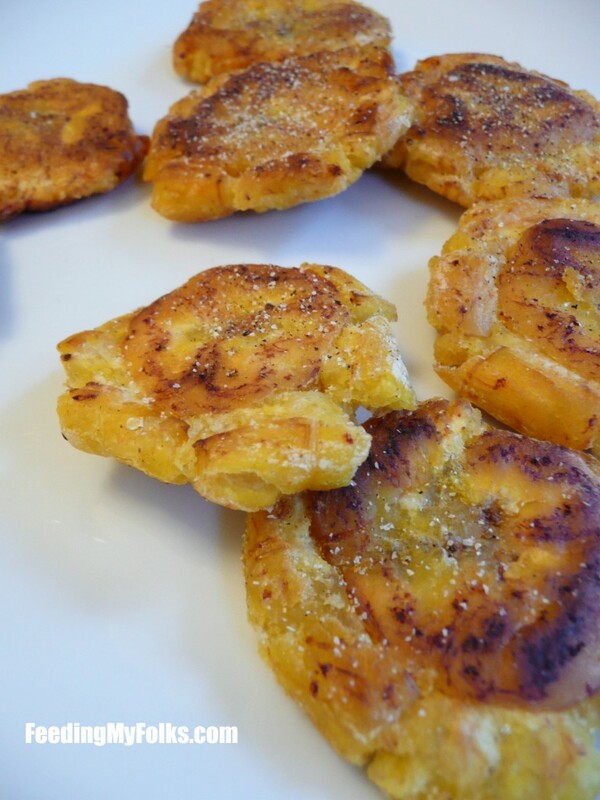 One of the simplest ways to cook up a plantain is by pan frying, smashing, then frying them again! This dish is called “tostones”…which basically just means toasted plantains. To get them toasted up, slice the plantain and pan fry. After “toasting” both sides, scoop them out and smash those suckers! Yes smash. It totally helps release some aggression haha. When each of the slices are smashes, fry them again. The little discs are crunchy on the outside with a slightly chewy center that’s meaty and totally satisfying. When you scoop them out of the hot oil, I highly recommend sprinkling them with a healthy pinch of salt, pepper, and garlic powder. Occasionally I use smoked paprika or chili powder too. Then serve the tostones with a creamy spicy dip out of mayonnaise or ranch dressing. All you do is mix together mayo/ranch, some crushed garlic, and hot sauce. 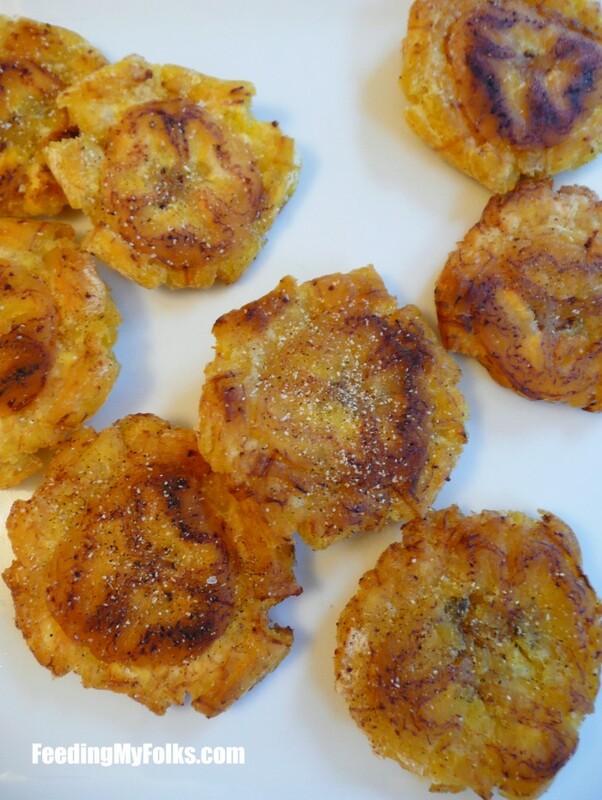 It’s insanely simple but pairs perfectly with the crisp plantains! Peel and slice the plantain into half inch slices. Heat the oil in a medium skillet over medium heat. Add the plantain slices to the skillet and sear the first side for 3 minutes (it will be lightly golden). Flip and fry the other side for 2 minutes. Remove slices from skillet. 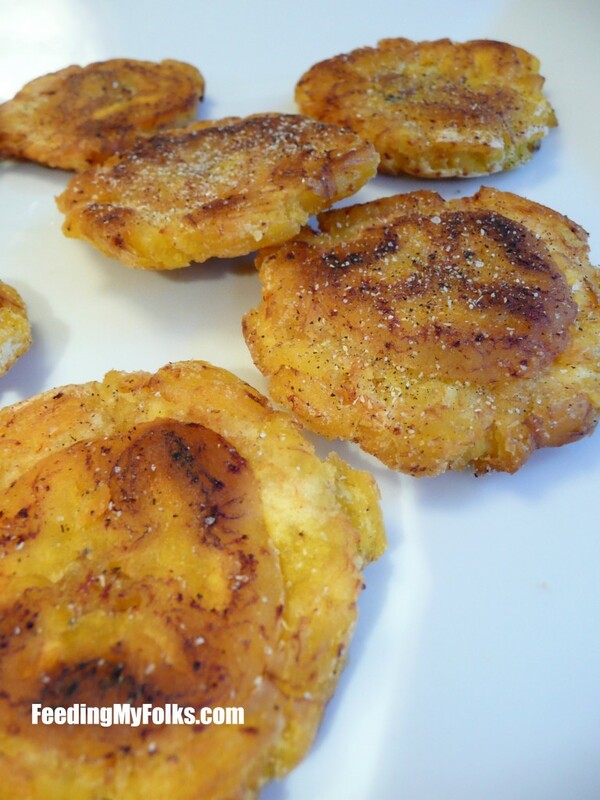 Put one of the plantain slices on a plate (be careful, they’re hot!). Using the bottom of a drinking glass, smash the plantain. Repeat for the rest of the slices. Add the smushed plantains back to the skillet and fry another 1-2 minutes per side. Remove from pan, sprinkle with salt/pepper/garlic powder. Serve with spicy mayo (1/2 cup mayo or ranch, 1 garlic clove crushed, hot sauce to taste). Sigh. After an unfortunate midlde school international home economics cooking assignment gone awry that resulted in burning my feet (yes, my feet), I no longer try to make fried plantains. But yours look yummy! Hi looks good. I’m puerto rican and we do these with a garlic dip. Crushed garlic, olive oil and little adobo. You have to try this Puerto Rican Restaurant in Trenton. Tropical Family Restuarant 120 lalor St in trenton. Have Mofongo! It’s reasonably priced and delicious food.